My Storm Chase Adventure from 1991 - Ontario Storms Site! Since I was a kid, I've always been interested in Storm Chasing. I even tried to chase them on my bicycle! Unlike other Storm Chasers I'm more interested in "experiencing" the weather rather than just take pictures or video of it. The following is one of the best Storm Chase experiences I ever had during a Road Trip across the state of Minnesota. All individuals in this story are referred to by their C.B. Handles, as I was not a Ham Radio Operator at the time. Every year when I was in my 20s, and early 30's, my buddy "California Fox" and I would go on a road trip. We'd usually go during the third week in July because that seems to be the highest chance of encountering a severe thunderstorm here in Minnesota. We also liked to check out the teen/hot rod cruising life in other towns and cities around the five state area. The summer of 1991 was the most exciting experience though. The National Weather Service was predicting Severe T-storms after midnight that day and we had scheduled a road trip up to Detroit Lakes, MN, after a friend of ours told us they cruised and drag raced big time in that town. We took my big 4x4 pick-up truck and headed up I-94, then cut over on some smaller State Highway into Detroit Lakes. The cruising wasn't all that great, we only met two people and there was no one on the CB Radio. A friend of ours and his girl-friend followed us up in his monster 4x4, so we did talk back and forth amongst ourselves with our CB radios as we drove along in our two vehicle convoy. We hung around town until just after midnight and that's when the lightning and rain was just starting. At this point I had a great idea, I had looked over the weather charts earlier that day and noticed that the storm front was stretched North/South across Western Minnesota and it was a slow moving one. I concluded that if we took Highway 10 all the way back, we would get the maximum effect of the storm front. Highway 10, for those of you who don't know, runs diagonally across our state from Northwest to Southeast. By taking this road back to the Twin Cities, we would be able to stay with the storm longer, we would "surf the frontal boundary" so to speak. My idea turned out to be one of the most exciting weather adventures I have ever had! As we were just leaving the town of Detroit Lakes, the rain began to get harder and harder. I told my buddy "Slick," and "Red," his girlfriend who was riding with him, to lag back about four miles so we could give each other weather reports and road conditions as we ventured the five-and-a-half hour drive home. About five miles out of town the torrential rain hit. It was the hardest rain I have ever been in. I had to turn on all my illegal off-road lights and have California Fox hold the 1.5 Million Candlepower Spotlight out the window just to see the white line in the center of the road! (Just a note here: we discovered years before on older vehicles, that if you are traveling down the freeway with your window open, the rain won't come in unless there is a cross wind, due to the aerodynamics of the vehicle). Now I pride myself on being able to drive 50 miles per hour, no matter how bad the weather conditions, and this was no different. We managed to maintain 50 mph using the Spot Light to see the white line. All the other traffic had pulled off the road to wait it out with their 4-ways blinking, or were stalled. I started giving Slick location reports of where all the cars were stalled. As we continued on our journey the wind started to pick up and then my Weather Alert Radio sounded its alarm. There was a Severe Thunderstorm WARNING for the area we were in! It was GREAT!!!!! We continued on our way thru rain so hard that even with my windshield wipers going full blast, all my off-road lights on, defrosters at maximum, and California Fox shining the Spot Light directly at the center of the road, all I could barely see was the one closest white line. Now the wind had begun to shake the truck sideways and small hail was pelting the windshield. I decided to start telling Fox some facts about Lightning, since the Lightning was almost continuous with this storm. I explained to him that Lightning likes the highest object around to strike, and we were on a flat open road. 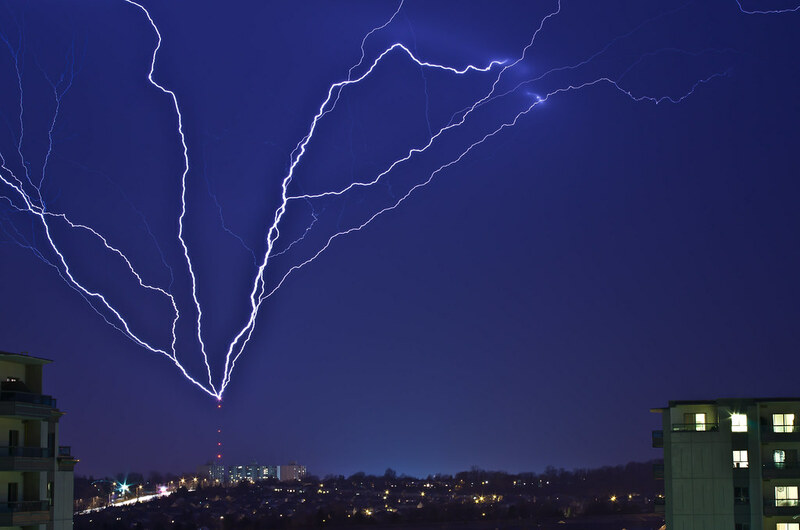 I then explained that lightning also is attracted to warm objects so if you are in a crowd of people, it is best to separate yourself from them. Fox then said, "Aren't you protected in a car from Lightning?" I told him you were as long as all the windows were rolled up, but since ours was down and his warm hand was hanging out holding the Spot Light, we had little protection. I continued to tell him that if Lightning did strike his hand it would probably arch from his head to mine and kill us both! He said he wasn't worried about it and we continued on our way. I could tell we were traveling perfectly along the frontal boundary because we would go from storm cell to storm cell. The rain and wind would let up a bit then return with a vengeance! The Weather Alert Radio kept going off, and each time we looked at the map and found we were in the middle of it. All of a sudden LIGHTNING STRUCK THE SIDE OF THE ROAD about 50 feet from us! We could see the bluish-white streak come down from the sky, as it struck the ground, the ground glowed a bright yellow, and then exploded upwards into the air in a great yellow-orange eruption! The sound of the Thunder was deafening and instantaneous as it rattled my whole truck, and a blast of warm air came through the open window! We both did a "cat call" and Calf. Fox began rolling up the window as fast as he could. I asked him what was the matter, and he said, "My hand is getting cold." I called him a liar and said he was really afraid of the Lightning. He just smiled. From that day on, I have called him "Lightning Chicken" or "LC." I happened to be talking to Slick on the CB when the Lightning struck and he said he heard the "snap" over the radio! As we continued along our way, I had to slow down because without the Spotlight I couldn't see the road as well. We got another Storm Warning and they said the winds were gusting up to 65 mph! We could see small tree limbs and debris sliding across the road in front of us as we went along. The truck was shaking back and forth and the extreme torrential rain kept gushing down. The roadway was so saturated with water it was like driving through a river and it sucked gasoline. I asked Slick how he was doing for fuel over the CB and he needed gas too. We decided to stop in Little Falls for gas. By the time I had gotten to Little Falls, Slick had caught up to me and was right behind. We were both wondering if there would even be a gas station open since we hadn't seen another vehicle for about two hours now, and we figured the power would be out all over town. The rain had stopped and a new storm warning went out for Little Falls. This time a possible Funnel Cloud was heading for town! We weren't going to stick around long since you cannot see Tornadoes very well at night and that makes it harder to get away from them. While we were waiting at a stoplight, Slick pulled up behind my truck and told me that my whole truck bed had filled up with water, and when I pulled away through the intersection it would come gushing over my tailgate and bumper like Niagara Falls! Now that's intense rain fall to fill up the back end of a full sized pickup truck! We all pulled into Holiday gas station with water gushing from our boxes, filled our tanks, and got some munchies. There was continuous Lightning to the West and we knew we didn't have much time before the next wave hit. About two minutes after we left the gas station, the storm hit again! We went through more of the same; storm after storm all the way until we got down to St. Cloud. About five miles before St. Cloud, I pulled ahead of the frontal boundary; the road was dry and the temperature rose about 20 degrees. Our four-hour storm experience was over. It was like driving through a Hurricane, and we would be talking about it for a long time to come. I have never driven in anything like it before or since. We arrived home in Minneapolis around 5:30 am. It was just starting to get light out, although it was cloudy so it wasn't that light. I said goodbye to my friends, and Calf. Fox got into his car to drive home since he lived in Little Canada. I offered he spend the night, but he wanted to get home. I went inside and began getting ready for bed. About 20 minutes after I got home the Weather Alert Radio went off and a HUGE storm slammed into Minneapolis! Wind gusts were in the 80 mph range and it was by far the most violent storm we had seen that night! The power to our house was knocked out immediately and within in few minutes Calf. Fox called me on the phone and said, "So if we drove through a Hurricane; what do you call this?!" His power was out too. He told me he had just walked in the door when the wind blew up, and there were trees and power lines down everywhere! We had unbelievably intense rain and wind with marble hail. The storm lasted about 30 minutes and brought down trees and power lines all over the Twin Cities area. Several roofs were torn off houses and buildings too. It was a spectacular finale to our big storm chase experience. After it was over, I got dressed and hopped into my car and went "puddle jumping," because I wanted to see how deep of a puddle the car would go through before stalling out. It had a new fuel injected engine (the first I ever owned) and my friend had told me that you cannot stall them out. I had to test his theory, and just figured I'd walk back home and get my 4x4 if I did stall. The rain had been so intense that there were flash floods all over the place. It wasn't hard to find some good puddles to slam through. My friend was right, I didn't stall my car. I also didn't get to bed until almost 9 am. either. Boy, was I tired and drained.